Sitting majestically above Fort William stands the ‘Ben’ otherwise named Ben Nevis, the mountains name originates from the Gaelic language Beinn Nibheis that translates terrible or poisonous giving the mountain a reputation of a deadly nature. The weather can be changeable on the mountain and can differ from each passing minute, very unpredictable especially in winter; walkers and climbers have to take extreme caution when tackling Ben Nevis ensuring they have the knowledge and equipment to stay safe. The climate on the Mountain can often be similar to arctic conditions consisting of very high winds and blizzards, and many adventurers have perished on this unforgiving mountain. Ben Nevis can be enjoyed if you prepare well and take a guided walk, Well worn mountain footpaths also guide the way,and in the Summer many thousands of people enjoy the quest to the top and enjoy the sights and ambience on a lovely clear day, many tours with experienced guides can be found around Fort William and the town also boasts many shops to equip you with all the equipment you will need. 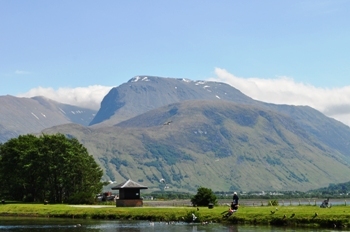 Ben Nevis stands proudly 4,409 feet (1,344 meters) above sea level and is Britain’s highest Mountain. At the top you will find the old Ben Nevis Observatory that was used to collect weather data from the Mountain between 1883 and 1904. Great views of the mountain can be seen from all around the Fort William area if you do not want to tackle the daunting trek up the Mountain. You can take a boat trip from Loch Linnhe where you will see fantastic views of the Mountain sitting proudly above For William, or take a drive through Glen Nevis and discover the outstanding beauty of the Glen, the mountain can also been seen from some areas of lochaber. When on Holiday in Scotland you have got to see at some point Ben Nevis, a holiday to Scotland would not be complete if you did not see the Ben. Simply outstanding and breathtaking and the glens and lochs around the mountain are spectacular and well worth a visit.